If E.T. phones, hang up. That's the implication from British astrophysicist Stephen Hawking, who said that while extraterrestrial life almost certainly exists, it could be dangerous for humans to interact with them. In a new documentary for British television, Hawking warns that communicating with intelligent alien lifeforms could be "too risky." He speculates most extraterrestrial life will be similar to microbes, or small animals - but adds that advanced lifeforms may be "nomads, looking to conquer and colonize." The 68-year-old scientist said a visit by extraterrestrials to Earth would be like Christopher Columbus arriving in the Americas, "which didn't turn out very well for the Native Americans." 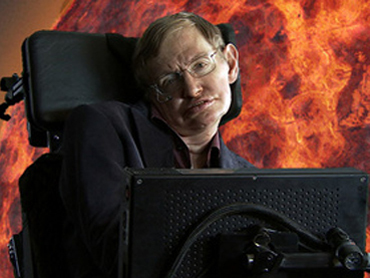 The Discovery Channel said Sunday it will broadcast "Stephen Hawking's Universe" in Britain next month.